In addition to the transformation of truffles and porcini mushrooms, a large part of the production of our company, concerns the oil. The products are prepared according to family tradition, without any industrial production process and without the addition of preservatives or colorants. 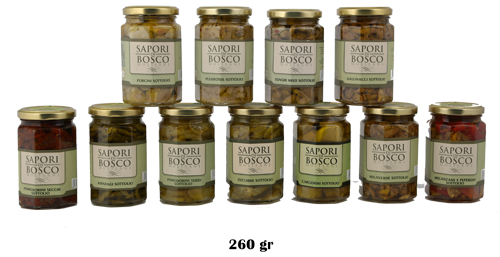 The vegetables are processed by hand and packaged by hand still fresh, in order to preserve the aroma and quality. A line of natural products, made even tastier by 'extra virgin olive oil which enhances the flavor and authenticity. The oil is composed of fresh vegetables and extra virgin olive oil. The oil should be consumed at room temperature. The oil is ideal to be enjoyed as an accompaniment to appetizers or side dishes.